Srinandini, alias Cheeni, daughter of my wife's elder sister Smt. Geetha Parthasarathy and Shri. R. Parthasarathy, and grand daughter of Shri G. Gopalakrishnan, Sub-Judge (Retd. ), now pursuing her education in the United States of America, entered into wedlock with Shri Pannag R Sanketi, on Friday, 22nd January 2010 at Chennai, India. 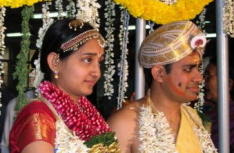 The wedding was arranged with the blessings of both the families and was held at New Woodlands Auditorium in Chennai. Fortunately, our family comprising me, wife Sumithra and son Sudharshan could attend the wedding and also travel alongwith the couple to Bengaluru where we attended the Sathyanarayana Pooja conducted by the family of the groom. Cheeni and Pannag are scheduled to leave for the US on 6th February 2010 after visiting the groom's village at Hassan and enjoying their honey moon in Wynad, Kerala. We wish the couple a very happy and long married life.